HAPPY NEW YEAR to all of you, new subscribers and old friends alike! I hope you've had a wonderful holiday and that there are many blessings in store for you in 2008. There are indeed things you can do "outside of riding season". Never mind the cold fingers and nose. 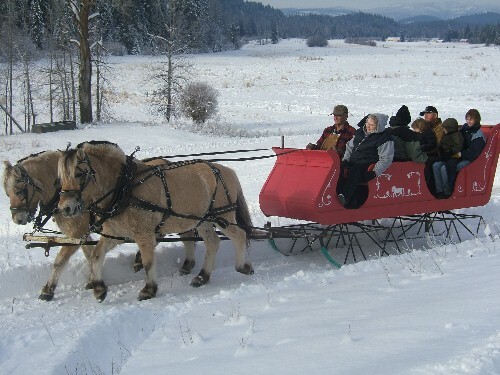 Here's a happy group and a pair of Norwegian Fjords enjoying a NW Montana winter outing. When I received this photo I was tempted to put Lars and Nessi in harness but, while we have plenty of snow, we have no sleigh. Many thanks to BUSHWHACKER FJORDS for permission to reproduce this great photograph. Equine Tile Art: Here's a trivet that serves admirably as an item of wall art. This saddle blanket will likely never touch the back of a horse. A nice addition to the bedroom. This Norwegian Headstall serves double duty, headgear for driving and a decorative item of wall art. I thought I'd touch on Home Decor this month. Bad timing you may say since items of home decor are great holiday gift ideas. But great timing isn't always one of my strong points. We recently acquired three items of home decor which are serving other than their primary intended purpose. To be specific there are saddle blankets in a guest bedroom, tile trivets (for the kitchen) in two bathrooms and a headstall in a tack room that really isn't a functioning tack room. I'll make a long story short an then talk a bit more about saddle blankets. The tile trivets were purchased at a local arts and crafts show last November. These attractive items of equine tile art were framed with wood and seemed as much at home on a wall as on a table or counter top. The ones we purchased would make attractive gifts and I should mention that we also looked over several tile wall murals with an equine theme. These tend to get a bit expensive but justifiably so. A search for equine tile art (or horse tile art) on the Internet will yield quite a few places to browse. Back In The Saddle has some fine gift ideas in this area. Two saddle blankets I purchased were intended for use as, well, saddle blankets. My wife liked the pattern and decided they looked just fine draped over the foot rails of our log guest beds. I have to agree. Saddle blankets can also add a nice touch to a railing or over a sofa. The ones I bought weren't real expensive so I can just keep on buying them until my wife runs out of ideas for home decor and then just use them on the horses! I've added a page on Western Saddle Pads and Blankets to the eclectic stew of gift ideas featured in Your Guide. Up until now this is an area I have not yet given much atttention. I've always used a wool/fleece saddle pad for riding and haven't found any particular reason to change. A quality saddle pad is something I can recommend from years of experience. Easy to work with, easy to clean, fits well, etc., etc.. The same can be said for the saddle blanket of course. Rather than getting into a discussion as to which is preferable, a pad or a blanket, I simply present them as being two options - both satisfactory. The Navaho saddle blanket is meant to be used, on a horse and under a saddle. Yet, genuine Navaho saddle blankets find their way in the home, in art galleries, and , particularly those made during the 19th century, as desirable collectibles. The traditional Navaho saddle blanket is characterized by an empty center surrounded by a patterned border. Not surprisng since the center of the blanket was not meant to be visible when used. So if you come across a genuine 19th century blanket you may at first be a little dissapointed in what you see, especially if you compare it to a modern, colorful, factory-produced "Navaho" blanket. A collector of these older horse blankets will see just the opposite of course. Not much different from a stamp collector who sees the beauty (an value) of a 19th century postage stamp featuring somelong dead king while not giving a colorful contemporary stamp a second glance. The word "elegant' fits these blankets to a T. The designs are generally very simple. The diamond and diagonal patterns result from the twill weave which also contributes to the exceptional strength and durability of these blankets. Like the Navaho rug, the saddle blankets are for all practical purposes indestructible, a tribute to the skills of the weaver. The blankets became more colorful towards the end of the 19th century as a greated variety of dye substances became available to the artists. Like so much of native American art, each authentic Navaho blanket often tells a story or contains a "secret". This is certainly true of the older blankets. One important characteristic of the authentic Navaho blanket is the continuous weave. There are no fringes or ties at the ends. There are single saddle blankets, usually measuring around 30 inches square and double blankets measuring roughly 30" by 60" and meant to be folded when placed on the horse's back. There are many advertisements for "Navaho" saddle blankets on the Net, from many sources. I suspect that most of these are not the genuine article though many of the items for sale are quality items. Because something costs more doesn't mean it's necessarily better or genuine but you're not going to find a genuine Navaho blanket for $9.95. Four or five times that amount may get you into the territory and will likely get you a quality blanket, Navaho or not. Certainly if you purchase a blanket from one of our more respected woolen mills you are going to get a blanket built to last. If you do want the genuine Navaho article you may have to do some searching and rely on someone who knows who sells what. I can't really help you there. What I can do is suggest a single or double blanket as either a gift to be used on the horse or in the home and there are plenty of quality saddle blankets out there, many with attractive southwestern designs - pads too. Here's a thought when considering a fine print as a gift. Think of the framing/mounting as part of the gift, not an added expense. A print can be framed or mounted, or simply taped to a wall. nothing wrong with the latter for the garage, tack room, or a very informal rec room. But for home decor, framing or mounting adds so much, giving the print a touch of elegance, often uniqueness. Some of my website visitors spend as much or more to have a print framed as for the print itself, evidently regarding the framing or mounting as part of the gift and worth every penny invested. The point is, recognize that framing is an additional expense but if you find it affordable a judicious choice among framing, matting, and mounting options available can lead to a very beautiful item of decor for a room or office. Framing: Natural wood gives a sense of character and tradition, a gold frame lends elegance and a touch of "class", metal provides a crisp contemporary feel and is often the best choice for photographic art. Mounting: A print mounted (without a frame) with a seperator to "lift" it away from the wall can greatly enhances the print's beauty ( and is also great for photographs). If you plan to enclose a framed print in glass consider non-glare glass, especially for a wall opposite a window or opposite a harshly lighted area. You may or may not choose to go the route of framing or mounting but I recommend looking into what options are available and see if one of them best suits your needs. 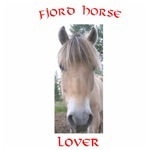 The Norwegian Fjord - The "Golden Retriever of the horse world". That's one description of this wonderful breed. Once again, have a great 2008!